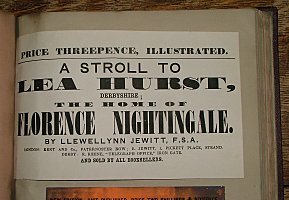 Llewellynn Jewitt was an artist and antiquarian in Derby, near Florence Nightingale's home at Lea Hurst. 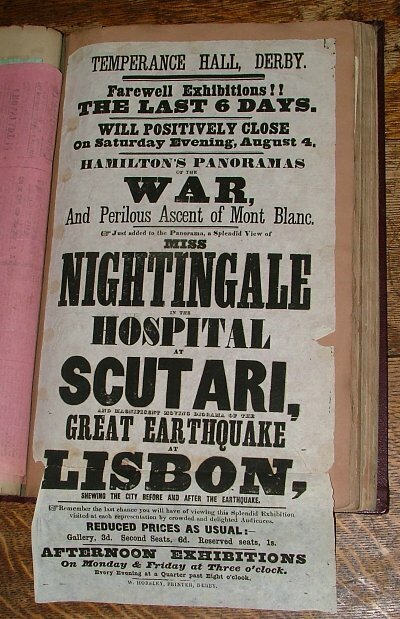 He was interested in Nightingale and kept a scrapbook of material relating to her life. 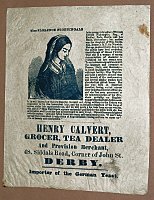 The scrapbook is preserved today in the Derby Local Studies Library. 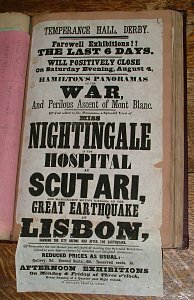 Leaflet announcing the sailing of "The Celebrated Clipper Ship Florence Nightingale." 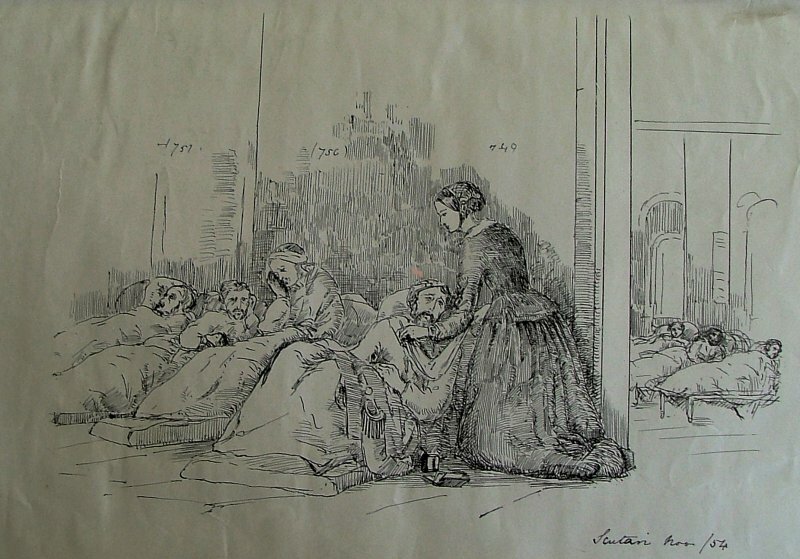 Drawing labeled "Scutari Nov/54." Presumably by Jewitt? 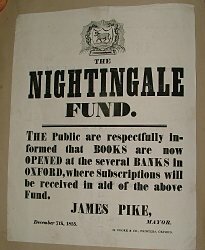 A grocer uses a portrait and biography of Nightingale to promote his wares. 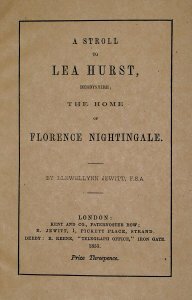 In 1855, Jewitt published a pamphlet on Florence Nightingale's home Lea Hurst. "F.S.A." 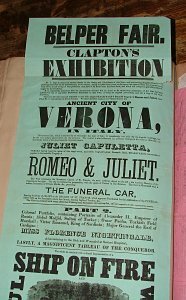 stands for Fellow of the Society of Antiquaries. 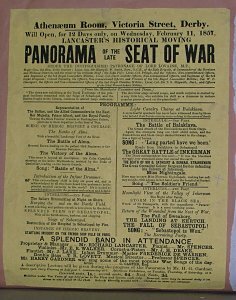 Panoramas and dioramas were a popular art form in the late 18th and 19th centuries.  Large painted canvasses depicted magnificent scenes of battles, disasters, and historical events. 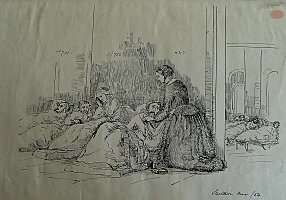 Sometimes the pictures were presented in a 360 degree setting. Other times the cavasses were scrolled along to represent travel through a distant landscape. Moving elements and lighting effects added excitement, a narrator recounted the story of the event, and a band played along. 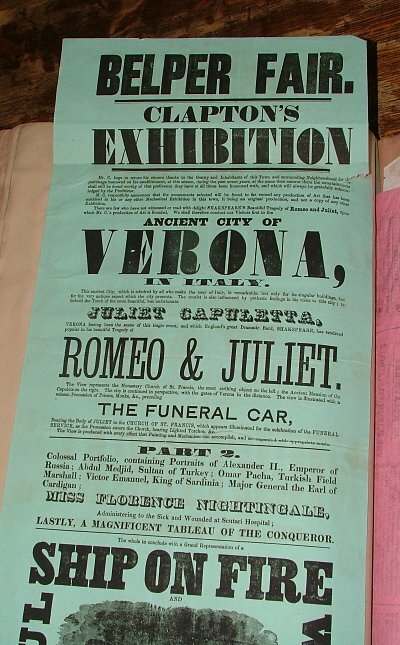 ("A Splendid Band in Attendance" reads one broadside below.) 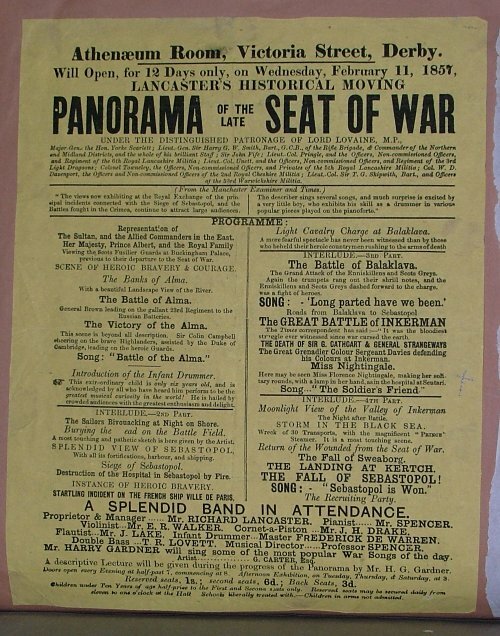 People paid a fee to enter the shows, which often travelled from town to town; it was like watching documentary movies, back before movies were invented. 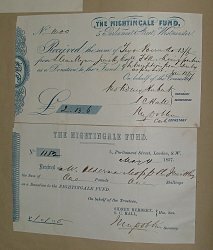 In 1855, Stanley Herbert and the Duke of Cambridge started the Nightingale Fund to raise money to train nurses. 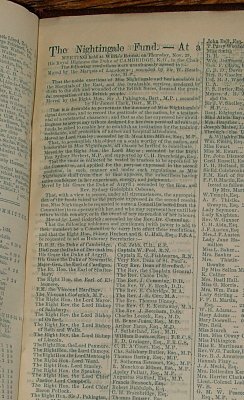 The Jewitt scrapbook has flyers, reciepts, and lists of contributors.